Room: Ta-da the new, powder room (bathroom)! What surprised me about this remodel is I came into it with a plan – and much of that plan was thrown out! It became important to be flexible and it’s one reason the room took longer then expected. Although the room wasn’t quite what I had originally imagined… it’s far better! As we progressed, it became clear that some things weren’t going to work out. The cream color for the cabinets just didn’t look good with the bright blue of the walls; the bird paintings were too yellow and square for the vertical height of the wall (and were moved to the hallway outside the bathroom), the first, selected light fixture was going to be too dark for the light feeling of the room, and the dark mirror frame got changed to silver. See the gallery of the new bathroom! For some time, I’ve felt that the height of the room (9 feet) needed to be featured. We did that with a speciality, pearl paint (Winter Blue Fox from Lowes) in a metallic silver for the ceiling, two patterns of crown moulding and a cabinet that reached all the way to the ceiling. Vertical artwork also draws your eye upwards. Originally we had picked a stock vanity but I kept looking for a unique table that we could use instead. This became a big headache because the space was so small that most dressers (at 34-36″ were too wide) and end tables were too low. Persistence paid off when we found this table at an antiques mall in another city. Stripped, sanded, and redone in the grey to match the cabinet it is topped with Italian marble and a vessel sink. For such a small room, it was expensive, time consuming and a pain in the neck. While I think it turned out lovely, I’ll be glad to work on some larger bathroom projects that don’t need as many changes. 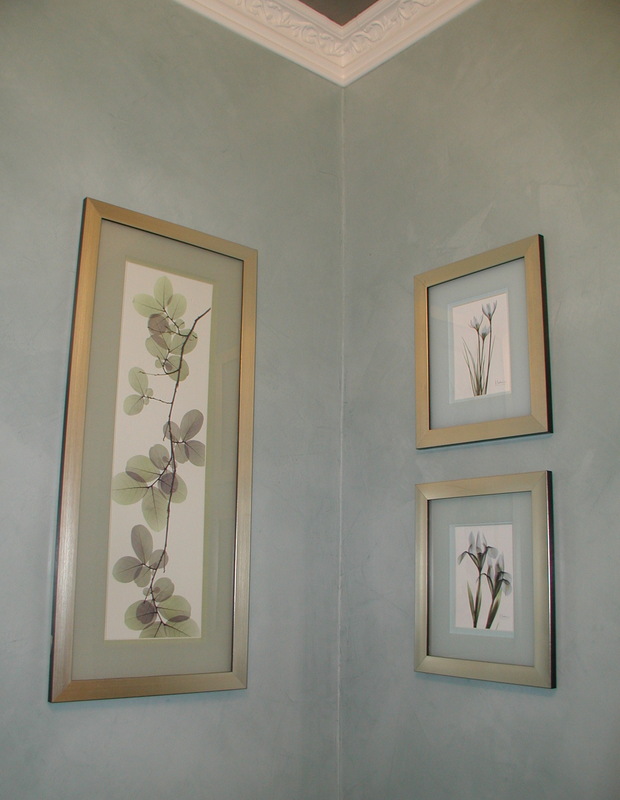 Wall finish– Lowes’ Venetian Plaster Aquamarina #67. Because we started with flat walls, one gallon did the job ($40). Ceiling – Lowes Pearl paint (Blue Winter Fox) with crown moulding ($80). Overjohn cabinet – extended height size with molding and wood, repainted, and new door pulls ($150). Fixtures and extras – lighting fixture ($25), mirror ($60), towels and towel bar, toilet paper hanger, toilet bowl brush, trash can ($60). Art – Artwork from Bed, Bath and Beyond (bought with $5 off coupons for $20 each small, $40 for the large) $120. Toilet – The one chosen for the downstairs powder room is a space saver, quiet flush from Jacuzzi ($200). This bathroom is now finished except for a few extra touches such as a towel bar and a soap dispenser — whew!! Because I’ve worked in graphic design and newspapers, I know a lot about layout. It makes arranging and hanging frames no real big deal however, just in case you could use a little help yourself, here are some basic ideas. A couple of things about art, you can look at it in the store and think it will work and get it home and it flat – does – not. Most of that is about light and color which changes throughout the house, and at the store you were probably under bright, flourescent light. 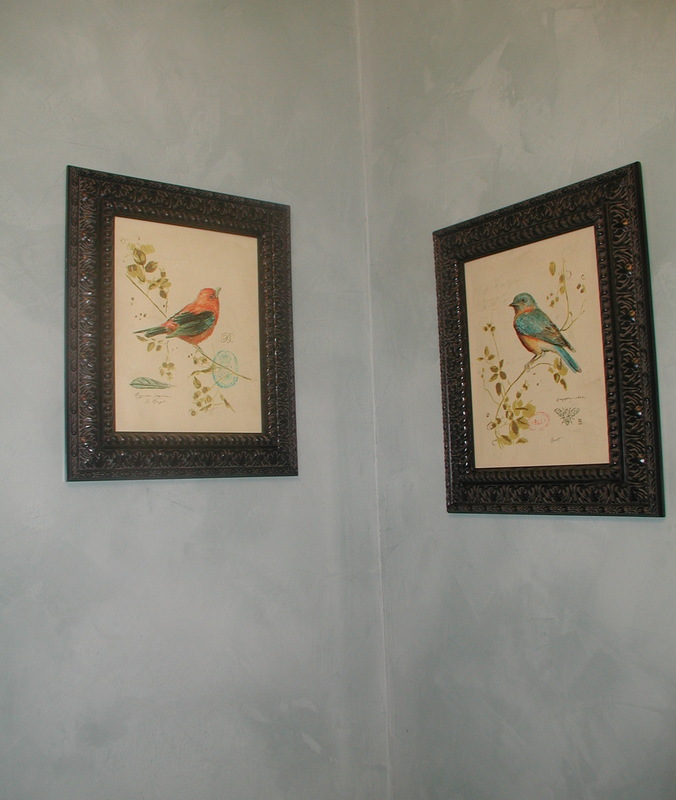 When I bought the two bird paintings for the bathroom, I was sure they would work. After living with them for a week, I just knew they did not. The yellow didn’t compliment the blue walls, and the dark frames, while beautiful, were too much of a contrast. Luckily, they found a better home in the hallway. Here is the new artwork for the bathroom …. much, much better!